Expertly-blended, trainer-tested, uniquely-effective flower essence formulas for dogs. Increase confidence, reduce stress, tone down negative behaviors - naturally. Stress busting, attitude adjusting flower essence blends for dogs. Naturally enhance focus, confidence, self control, and more! Aldaron Essences is pleased to offer over 30 flower essence blends, expertly-designed to provide stress and anxiety relief for dogs, and tone down negative behaviors – naturally. Many common dog behavior issues respond beautifully to flower essences: shyness, anxiety, fears and phobias; frustration behaviors like leash lunging and reactivity; lack of confidence; excessive neediness; separation anxiety; controlling, bossy, “alpha” type attitudes... All these behaviors can be improved with flower essence therapy. Flower Essences are dilute liquids that contain the energy signatures (or "essences") of various healing flowers. These delicate preparations gently adjust extreme or out-of-balance emotions, essentially “re-tuning” an emotional perspective. Each individual essence works over time to heal a specific emotional state, bringing it back into healthy balance. In use since their discovery in the 1930's, Bach flower remedies are recognized and used world-wide, benefiting the emotional health and well-being of humans and animals alike. Dr. Bach's renowned 5-flower essence blend, Rescue Remedy, is one of the world's most familiar and trusted natural therapies. Dog trainers and fanciers are well-acquainted with Rescue Remedy for calming stressed, anxious dogs. At Aldaron Essences, we make use of not only Rescue Remedy, but all 38 Bach flower remedies. This allows our formulas to address a range of dog behaviors not possible with Rescue Remedy alone. Most dog behavior problems have an emotional component. The dog is too anxious, too territorial, too hyper, too attached to the owner, too suspicious of strangers, and so on. If the emotions behind the behavior are brought back into balance, the behavior itself becomes much easier to work with and resolve. 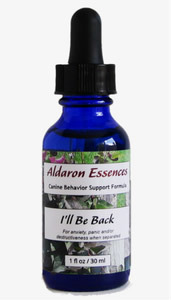 So, while Aldaron flower essence formulas are not a replacement for proper training, veterinary care, diet and exercise, these gentle, natural formulas can make a world of difference when tackling a difficult behavior issue. Simply give a few drops to your dog - on a treat, in her food, or straight into her mouth - 3 times each day. (Consistency is key to see results.) Improved, more balanced reactions typically begin within 3 to 14 days and gradually build over time. All-natural flower remedies are non-toxic, non-habit-forming, have no negative side effects, and cannot be overdosed. This makes them an ideal, and drug-free, tool to help you bring out the best in your dog. Take some time to browse our categories of formulas. You may be surprised to discover the range of dog behavior issues our formulas successfully address. And if you'd like to learn more, check out our full article, Flower Essences: What They Are and How They Can Help Your Dog.